APECA and members of the communities planted more than 3,000 trees over the course of two years; the seeds from these trees are being nurtured by villagers for continuous gestation. When managed well, materials from these trees are available as a valuable renewable resource for the wider area, and an economic resource for local communities. The trees can be used in local construction as well as sold to outlying communities. designed by local experts in agriculture and natural resources. The training focus on the villager’s role in maintaining the health and sustainability of the rain-forest. Local Promotores de Conservation monitor the success of the trees, and mobilize the community as needed to continue the project. This reforestation project solves a need identified by the villagers. It engages the villagers in learning how to manage their complex and glorious environment for their children’s future; and it protects the rain-forest, benefiting every being on this planet. The fundamental importance of individual and corporate donations in achieving the overall program mission of APECA cannot be underestimated. The commitment and generosity of individuals and various organizations have served as the foundation of this organization, and thereby encourages local villagers who give generously of their time and labor. Rainforests sustain ALL of us. They help regulate the global climate and maintain the earth’s fragile balance. The Amazon rainforest – the “heart-pump” of our weather system – is the world’s largest and most biodiverse tropical rainforest, covering an area greater than the continental United States. It houses one-third of the Earth’s plant and animal species, and produces one-fifth of all its flowing fresh water. In fact, the Amazon rainforest creates its own flying rivers in the sky from the water vapor formed by massive transpiration from its trees. Nearly 400 distinct indigenous peoples depend on the Amazon rainforest for their physical and cultural survival. And the Amazon depends on them. For thousands of years, indigenous peoples have been its steadfast stewards, and they continue to resolutely protect their home every day. To survive the coming climate crisis we must protect the Amazon rainforest. By far the best way to do that is to advance the rights of its indigenous protectors. By standing with “Amazon Watch” (as one example) you are supporting APECA's work with indigenous leaders who are growing the global movement to end fossil fuel extraction and stop deforestation. After years of unmanaged consumption, villagers have depleted their wood sources. They must cross the river, pass through other communities, and travel deep into the jungle for wood and palms suitable to construct their houses. In many populated areas, natural resources are not easily available for construction, cooking fuel or furniture. 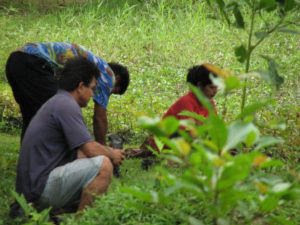 APECA is educating and supporting villagers in their efforts to engage in reforestation. The current five year reforestation project uses the model of a two year pilot project conducted in 2006/2007 by APECA in the community of San Francisco de Angamos, located on the Muyuy Islands. This group of islands, located between El Fundo and Iquitos, is home to fifteen communities. During the dry season, eleven islands are present; however, the rainy season floods all but the largest four or five islands. This grouping of islands is an example of a widespread serious environmental problem leading to deforestation. Utilizing seedlings cultivated at El Fundo, APECA coordinated the planting of over 2,200 trees. Every member of San Francisco de Angamos participated in clearing the area (dense rainforest) and in the planting, working alongside APECA and its volunteers from Global Development Links. This two-year project was made possible by APECA facilitating the coordination between the local communities of Fernando Lores in the Region of Loreto, the local Ministry of Agriculture, and the National Institute of Natural Resources. The reforestation project focuses on two plantings of species integral to biodiversity of the area: Capirona (Calycophyllum spruceanum) and Yarina Palm (Phytelephas Macrocarpa). Capirona wood is used to build village houses (post and beam with no exterior walls) and fronds from the Yarina Palm are woven to create a thatched roof. All of the trees planted in the reforestation projects were and are germinated and nurtured at the El Fundo nursery. The entire area is a seedbed, rich in seeds from local plants that provide for us. These seeds are collected and planted. As the seedlings grow, APECA volunteers and hired day laborers replant them in bags ready for transport to the communities. APECA in Peru, is a grass roots organization working with remote village populations, with special focus on the education of youth who will become future conscientious foresters. 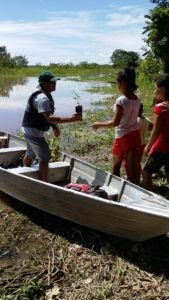 Among its many projects APECA is providing saplings with seminars on forestry skills to 10 year olds in remote Amazon river villages to be mentored by trained community-elected conservation leadership. Many of the youth in the project of APECA's Youth Forestry have been born to families who have had the community experience of Promotores de Salud. Trained Parteras (Midwives) have helped in their birthing. Now these children are being educated to nurture the trees to replenish the forest and effectively stabilize their community.